Unfortunately, Kevin Klein is not close to returning to the Rangers lineup, and could be out for a total of six weeks with a broken arm. Photo courtesy of MSG Photos. Following the Rangers 5-2 home loss to the Washington Capitals, fans received some more bad news when it was discovered that Kevin Klein would not be making the trip to Winnipeg and Minnesota. At first, Klein was expected to miss three to four weeks, but according to Vigneault, Klein is two weeks into what will be a four to six week injury. 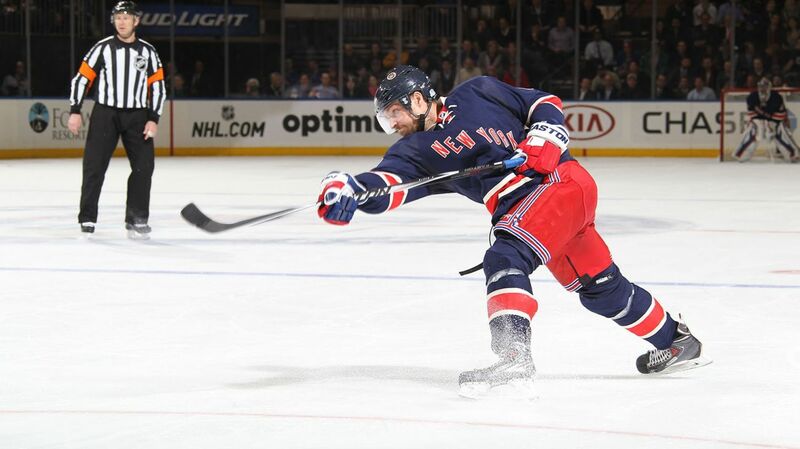 Klein broke his arm blocking an Alex Ovechkin shot late in a 3-1 Rangers win in D.C. This is troubling news for a Rangers squad that has struggled defensively lately, giving up four or more goals in three of the last four games. Matt Hunwick has done a serviceable job filling in, but having the always steady Kevin Klein back in the lineup would certainly help solidify the back end. Losing Klein also left the Rangers missing a natural righty, forcing Vigneault to shift guys like Keith Yandle, Ryan McDonagh, and Matt Hunwick to the right side, creating some unorthodox defensive pairings that haven’t worked tremendously well. Klein was a +24 with nine goals and 17 assists prior to his injury, and his hard slap shot and tendency to come through in the clutch has been sorely missed in the lineup. The fact that his absence could extend a few more weeks is not great news for a Rangers team that really needs to tighten up on the back end. Martin St. Louis is the other member of the Blueshirts that has been out of the lineup for a while, but unlike Klein, he is very close to returning. St. Louis continues to skate, both by himself and while taking shots, and is getting better daily. St. Louis’ scoring touch would be a huge asset back in the Rangers lineup, and he may be able to help an anemic power play that was 0-5 on Sunday. With the University of Minnesota’s season coming to an end in the NCAA tournament, sources close to the New York post have said that the Rangers are actively trying to sign 2012 first-round pick Brady Skjei, pronounced “Shay,” to a contract, and get him with the Hartford Wolf Pack as soon as possible. Brady Skjei, one of the Rangers best prospects, could be signing a deal with New York in an attempt to get him some playing time in Hartford, as well as a potential call up to the playoff roster. Photo courtesy of Paul J. Bereswill. The 6-foot-3, 205 pound Brady Skjei, just turned 21, and is one of New York’s best prospects, with many scouts and writers saying that he is very close to NHL ready. He is a tremendous skater with great size, and is projected as a potential top four defenseman. Skjei could be slated to join the Rangers playoff roster if he performs well with Hartford, who have nine games remaining. Back in 2012, the Rangers recalled Chris Kreider for the playoffs following the end of his collegiate career at Boston College. In 18 playoff games, Kreider scored five goals with two assists in his first NHL action. Kevin Hayes has flourished in his first NHL season fresh out of Boston College, with 39 points (15-24-39) in his rookie season. So needless to say, college call-ups have worked well for the Rangers. 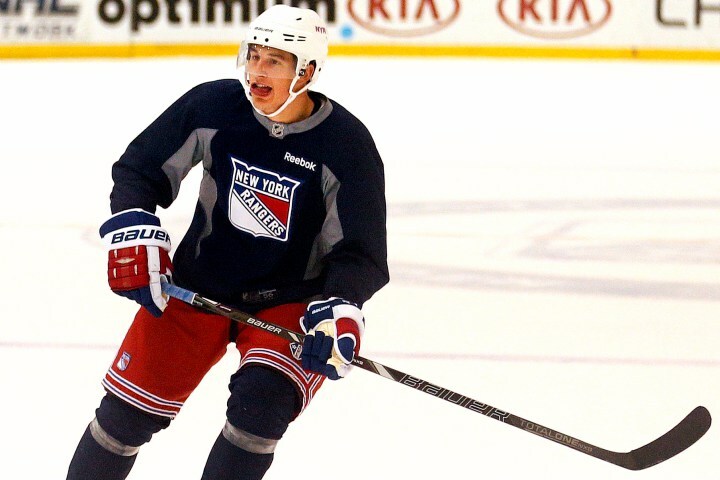 The other potential prospect that could be signed by the Rangers is Pavel Buchnevich. Buchnevich, 19, played this season with the Severstal Cherepovets, scoring seven goals with 11 assists for 18 points in just 40 games. In the World Juniors Championship, he had two goals and five assists in seven games with team Russia. Buchnevich is another highly-touted prospect that some people believe is pretty close to making an NHL team. New York wants to sign him to a PTO or an ELC to play for the Wolf Pack and develop. Some time with Hartford, as well as some bulking to his 6-foot-1, 176 pound frame. Posted on March 31, 2015, in Rangers Updates and tagged Alain Vigneault, Alex Ovechkin, Brady Skjei, Chris Kreider, Kevin Hayes, Kevin Klein, King Henrik, Madison Square Garden, Martin St. Louis, Matt Hunwick, MSG, MSL, New York Rangers, NHL, NHL 2014-2015 Season, NY Rangers, NYR, Pavel Buchnevich, Rangers, Rangers Nation, Rangerstown, The Ranger Zone, Washington Capitals. Bookmark the permalink. Leave a comment.